Moms Stop the Harm co-founders Lorna Thomas, left, and Petra Schulz, near a bench dedicated to Lorna's son Alex in Edmonton, Alta. on Nov. 9, 2018. Leslie McBain, Petra Schulz and Lorna Thomas share a common, unwanted bond. Each of them has endured the pain of losing a son to drugs. Ms. McBain’s only child, Jordan Miller, died of an accidental opioid overdose in February, 2014. Ms. Schulz’s youngest child, Danny Schulz, died in April, 2014, after taking an opioid he didn’t realize was fentanyl, which is extremely potent and often fatal. 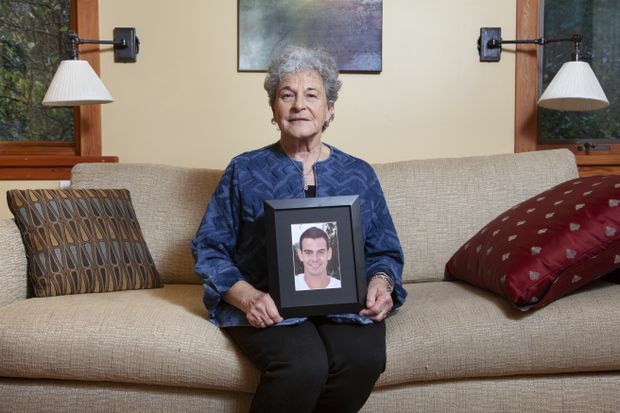 Ms. Thomas’ son, Alex Thomas-Haug, died by suicide in 2012 after struggling with depression and cocaine use. The three women are far from alone. Nearly 4,000 people died in Canada last year as a result of opioids. The jarring statistic propelled the country’s drug crisis to the forefront of public discussion. But we don’t often hear about the family members and friends, left behind have to pick up the pieces after a loved one dies from a drug-related cause. 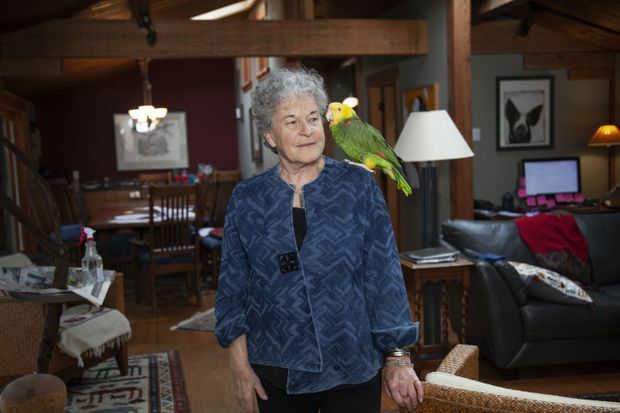 Moms Stop The Harm founder Leslie McBain at her home on Pender Island. Ms. McBain’s only child, Jordan Miller, died of an accidental opioid overdose in February, 2014. Ms. McBain, Ms. Schulz and Ms. Thomas are working to change that. In the early days, their grief engulfed them. Then, it gave way to anger and determination. If Canada had adequate programs in place to treat mental illness and addiction, the women say, perhaps their children would still be here. It was happenstance that the women found each other. Ms. Schulz had told her son’s story in an Edmonton newspaper, hoping to spur drug policy and addiction treatment changes. Ms. McBain, who is originally from Edmonton but now lives on Pender Island in B.C., said her brother saw the article and sent it to her. Ms. Thomas, who also lives in Edmonton, saw the story and reached out to Ms. Schulz. The women instantly understood one another and, shortly after, they founded Moms Stop the Harm, an advocacy group with a dogged purpose to change the way drug addiction is treated in Canada. They’ve had remarkable success since their founding in 2016. Moms Stop the Harm is an advocacy group with a dogged purpose to change the way drug addiction is treated. Moms Stop the Harm has been instrumental in helping make naloxone, a drug that can reverse opioid overdoses, more accessible. They helped successfully advocate for Canada’s Good Samaritan overdose law, which protects people, including those who have been using drugs, from criminal charges if they call emergency services for a drug overdose. Their online group has become a national meeting place for bereaved parents and even offers a handbook to help them navigate the agonizing experience. Less than three years after it was formed, the grassroots group has over 600 members – all of whom have experienced the death of a child who had struggled with chronic drug use. In addition to Ms. McBain, Ms. Schulz and Ms. Thomas, many members speak at community events, rallies and in meetings with politicians and health policy officials. Unlike doctors or drug policy experts, members of Moms Stop the Harm speak from personal experience about the ravages of Canada’s drug crisis and what changes are needed to save other children. Marie Agioritis, a board member with Moms Stop the Harm and its Saskatchewan leader, discovered the group, and her voice, following the death of her son in 2015. Less than three years after it was formed, the grassroots group has over 600 members – all of whom have experienced the death of a child who had struggled with chronic drug use. Ms. McBain saw the power their voices can have during a recent meeting with a provincial health official. When she started to tell her son’s story, one of the high-ranking bureaucrats in the room began to cry. It turns out he had recently lost a family member to a drug overdose. The group is focused on recasting the drug crisis as an urgent health priority, not a criminal justice issue. The toll from Canada’s opioid crisis is getting worse, which is why the network says a different approach is needed. They want to see harm reduction sites across the country, improved access to addiction and treatment services, and decriminalization of drugs. Federal NDP health critic Don Davies said he’s met with Moms Stop the Harm members several times and they’ve helped shape his thinking around harm reduction. He had the chance to speak at one of their rallies last June and said he’s impressed by their focus on bringing addiction issues out of the shadows. The co-founders of Moms Stop the Harm say they will never stop telling their children’s stories because people need to understand drug addiction is not about nameless, faceless junkies in the street. It’s a complex problem facing many families, which is why the group wants to erase the stigma and focus on getting people the help they need.